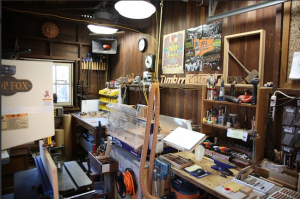 The first thing that strikes you when you step inside Dom Peralta’s garage/maker space in San Mateo isn’t necessarily the high-pitched drilling of his ShopBot Desktop’s spindle. Rather it’s the very pleasant and heady aroma of natural California cedar. 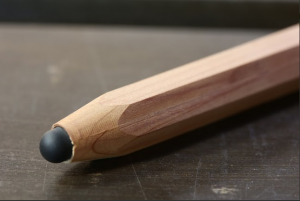 That’s because the ShopBot is hard at work precision-cutting wooden dowels of cedar for the Timbrr Stylus, an ergonomic stylus for you to use with your touchscreen tablet or smartphone. The Timbrr Stylus is the brainchild of the team of Dom Peralta and Jon Corpuz, corporate industrial designers by day, and entrepreneurial Maker Pros on nights, weekends….and just about every possible waking moment. Right now they’re hard at work getting Timbrr Styluses completed to show off at the 2014 Maker Faire in San Mateo, and putting the final touches on a Kickstarter campaign to help the duo expand production. Read the full story and see more photos at 100kGarages.com.